This month we availed of the fairly new route with AerLingus … Dublin to Newquay. Cornwall has been a beloved holiday destination of mine for about 20 years but it can be quite a trek, so to have hopped on a sweet little plane after a brunch in Dublin airport and in just over an hour to be in taxi whizzing through windy roads the tiny little village of Portloe was a delightful revelation. 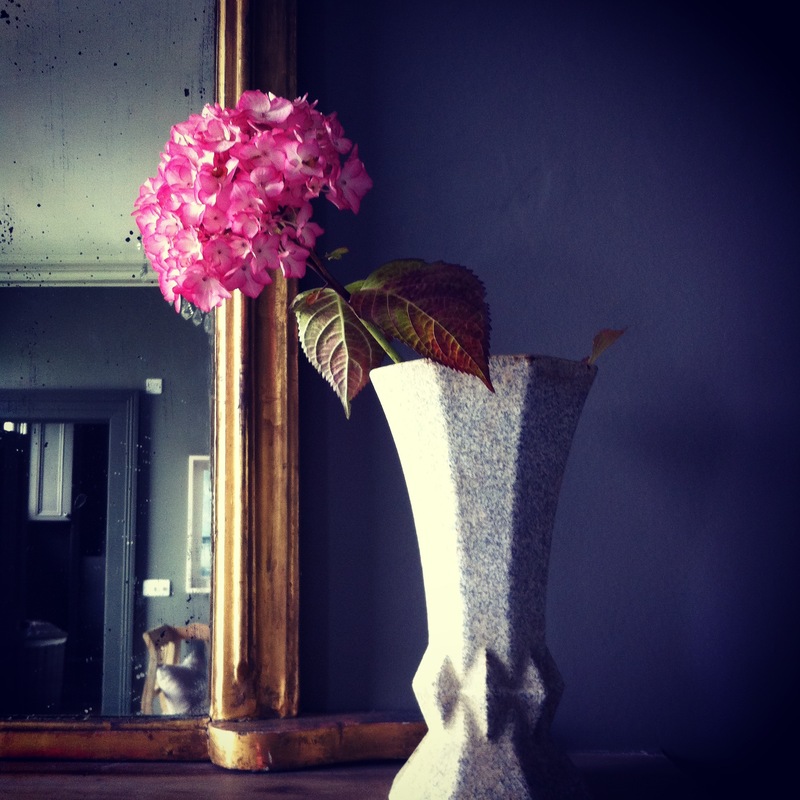 Anyhow my ‘thing’ when I travel is to buy ceramics, something you can use when you get home and nod to fond memories as you sup your tea or look for the right vessel to best enhance the latest blooms from the garden. My latest grá is for painterly ceramics – each piece is unique, a 3D painting really so what an affordable way to collect! Each piece adds colour and pattern to the room they’re in whether they are on the kitchen table, on a window sill or in pride of place on a shelf. I try and keep a record of who has made them also. Above there are pieces by Kevin Warren, bottom left while top left is by David Garland and the little pot by the boxing hare is fish pye pottery. If you go to Cornwall, I would recommend a visit to The Sandpiper Gallery in Mousehole where new owner Celia has curated a delicious mix of colours & textures in the dreamy setting of an airy room overlooking the harbour. In St Ives – which is synonymous with art & studio pottery, there is a hidden gem St Ives Ceramics which has an informal shop but as you sink deeper in to the depths of the building it takes on a museum like quality as the most fantastic collection of Japanese & British pottery (including plenty of Bernard Leach pieces) spanning a century, these are behind glass so there is no worries about knocking anything over with your giant handbag (that’s me). That part of the shop would be for the avid collectors and perhaps not a starting point. Buy something that catches your eye – that you want to cradle in your hands, wrapped carefully it will travel back nestled in your suitcase – unpacking becomes a joy as you unwrap the pieces and see them immediately brighten up their new surroundings. On we go upstairs – a large scale antique patchwork wall hanging in the stairwell is contemporary while also bringing texture and gravitas to the space. 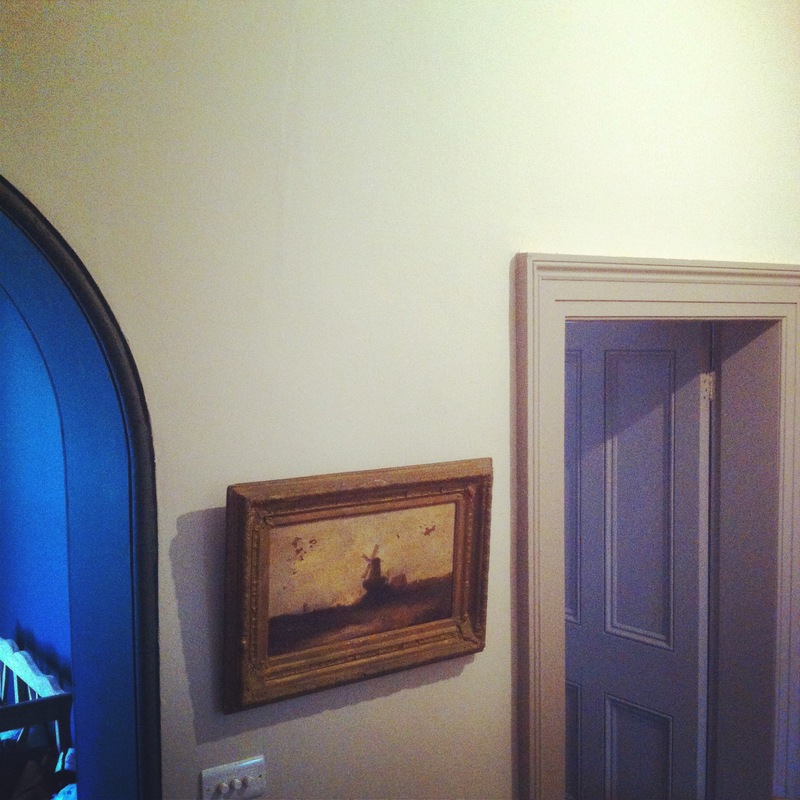 The stairway leads up to one of my favourite places in the house – the spacious landing. 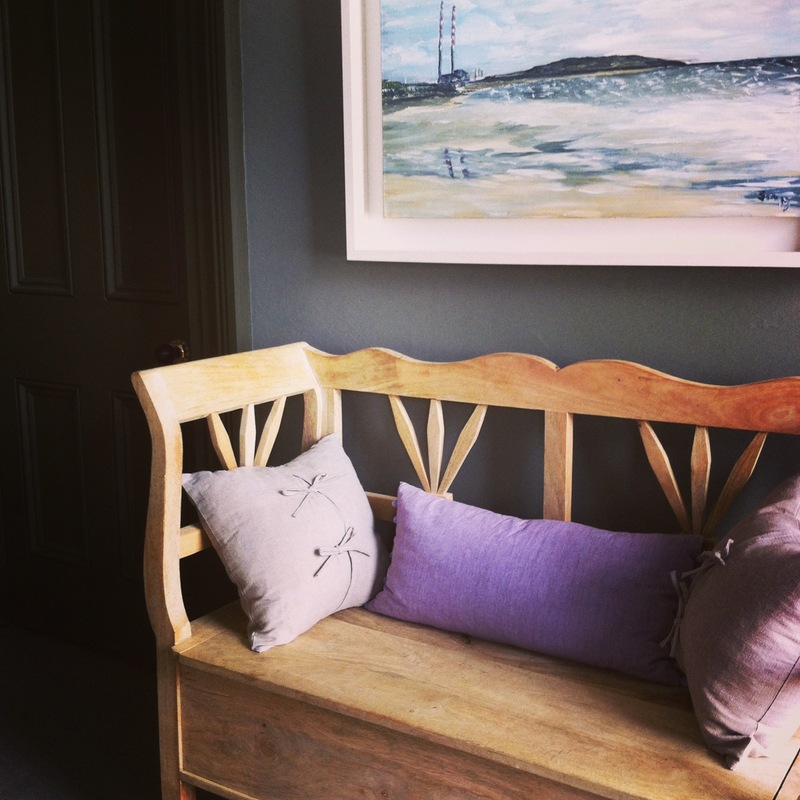 I commissioned fellow Wicklow based craftsman James Carroll to make a bench for this particular space. The seat has been made from Elm, the legs from Ash with inset details in Walnut – all grown in Wicklow. 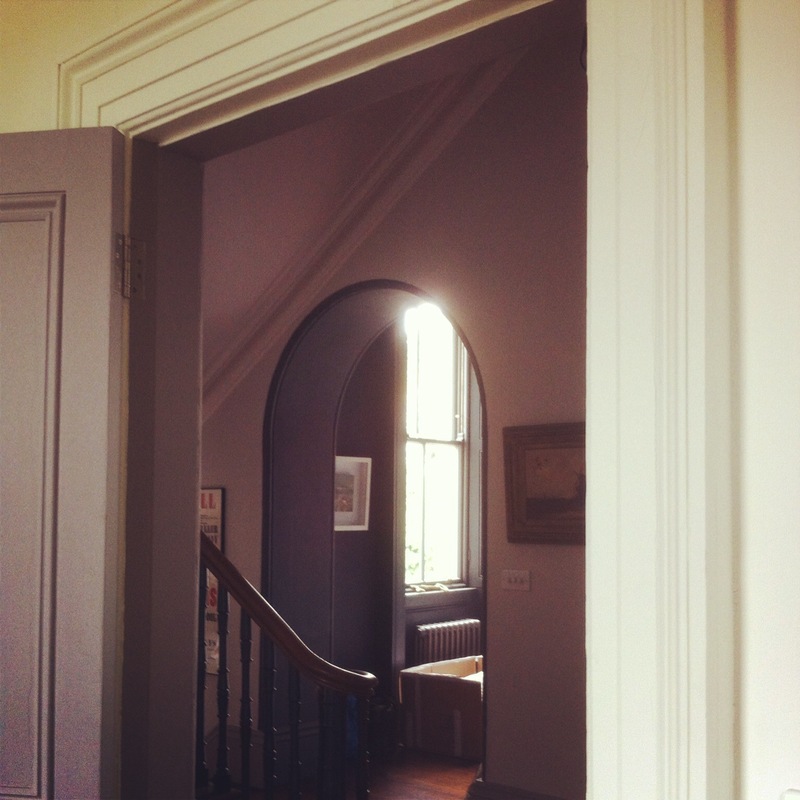 Glimpse in to one of the rooms leading off here and we see a gorgeous little etching / aquatint called ‘Cloud: Half formed’ by Niamh Flanagan. In to the first bedroom which has a balcony looking out to the hills. There is crisp white linen, a felt wool upholstered headboard, a quilted cotton bedspread and herringbone throw all set off by the restful blue of the walls. Loving the seagulls flying above the bed. Next we have the family bathroom – the wall tiles here remind me of distressed metal. They are warmed up by the solid oak bathroom accessories. It is all very simple in here. As with all the bathrooms in the house, there are lots of clean lines and plenty of places to put everything, be it decorative or functional. There are charcoal linen blinds and concrete floor tiles setting off the paler grey of the tile. Down the passageway to two more bedrooms..
We are now in the guest bedroom with en-suite, a room that I think could easily be an alternative master bedroom. Across the hallway a door leads in to the twin room. I think twin beds are really versatile in a home. I spent a lot of time in other peoples’ homes and I am increasingly finding that children love sharing a room with their siblings – creating a lifelong bond. I was also thinking of the house being full of visitors and twin beds in a guest room is so much more versatile for overnight guests. This is a very serene and opulent room with dusty pink velvets and linens, inspired by the botanic etching on the wall by Marta Wakula-Mac. A stunning etching by Maev Lenaghan ‘La Vie en Rose’ sits beautifully in the dressing room. 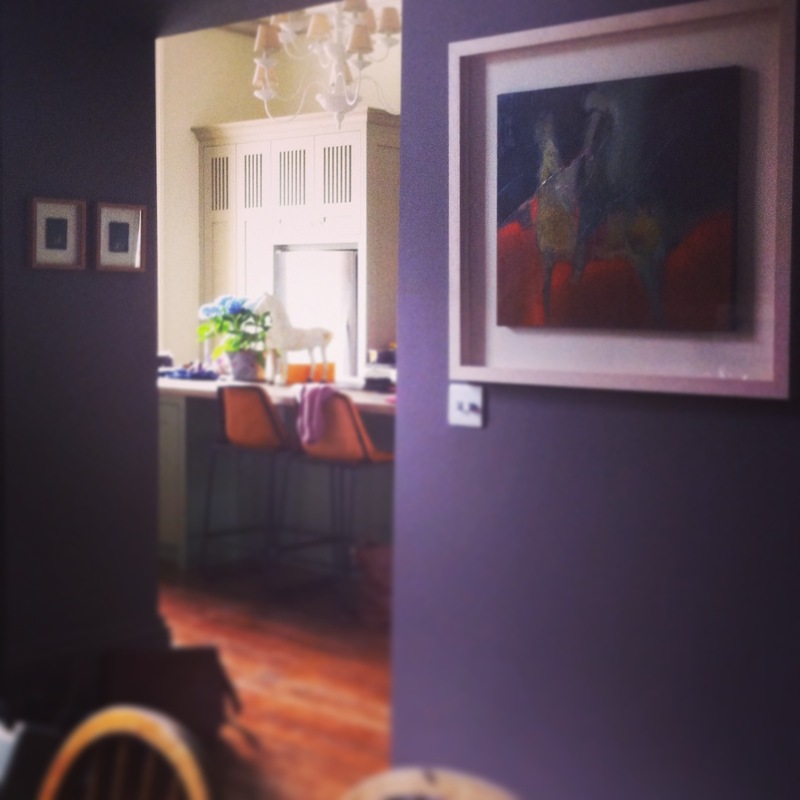 All the artworks in the house were acquired through my Home Curation Service and were intrinsic to the colours and feel of every room. 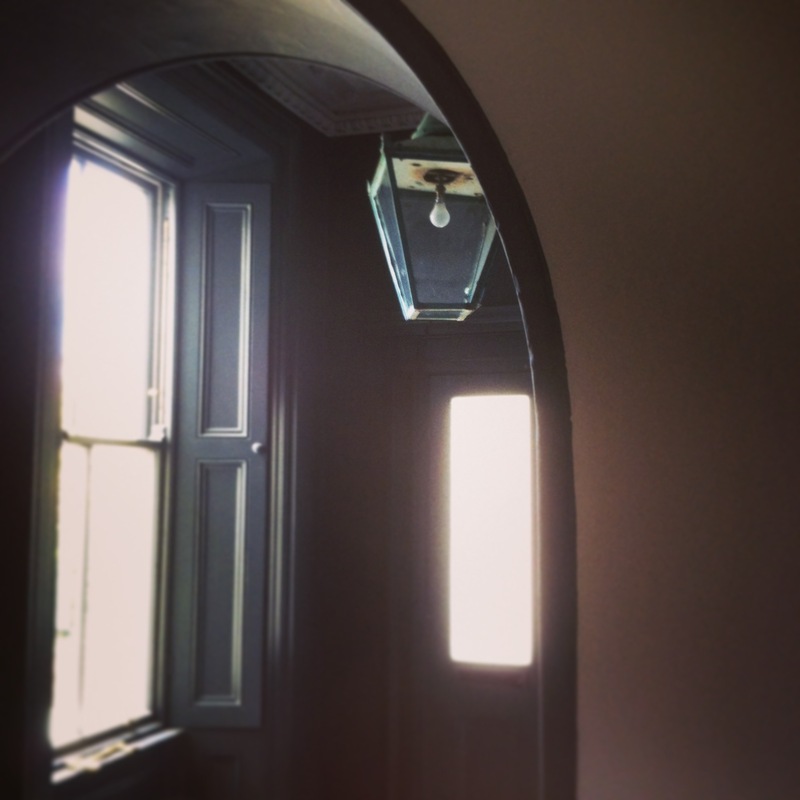 This atmospheric vestibule leads through to the most fabulous en-suite, it feels like this room goes on forever. Here the porcelain tiles resemble slate, creating a rich contrast with the oak and white. LOVE it. Thus concludes the tour of Cluain Mara nestled in the hill above the beautiful harbour town of Kinsale. 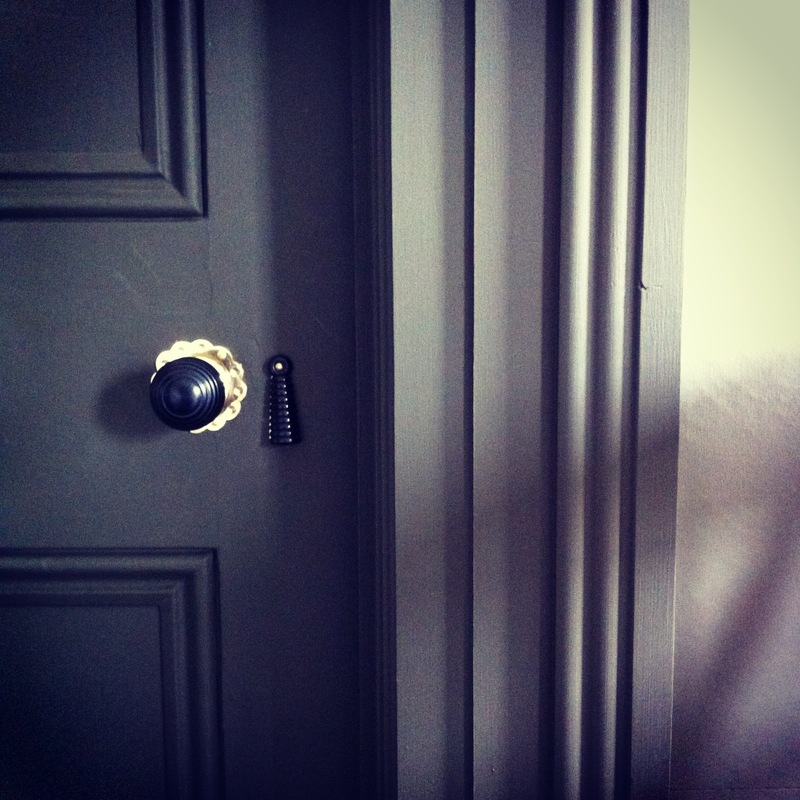 I have hugely enjoyed being given free reign to create a home that is rich in atmosphere and decorative detail, inspired by the colours and textures of its surrounds. 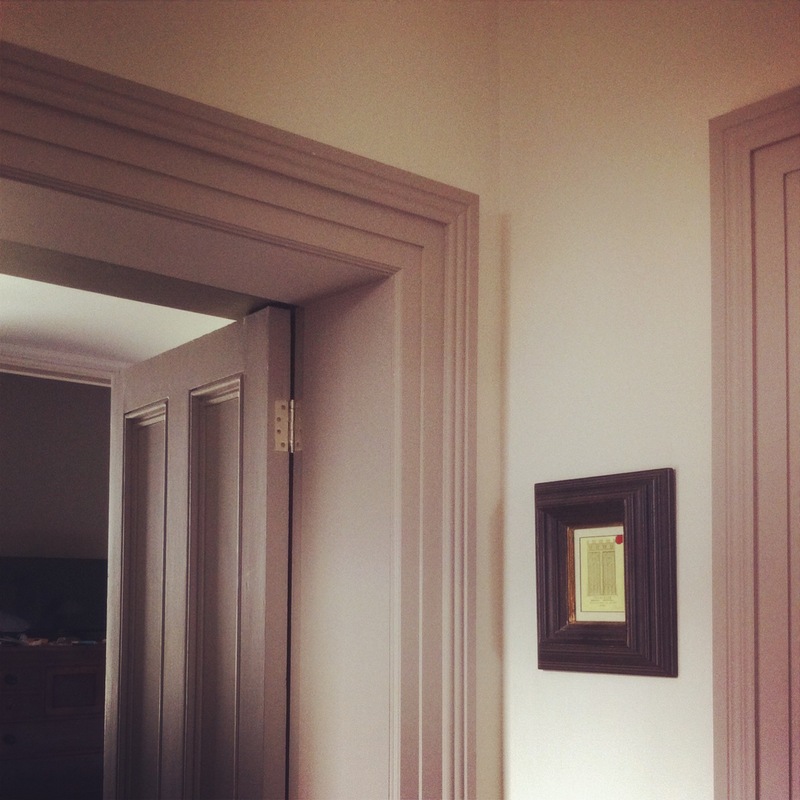 I recently created a very special master bedroom in a clients early Victorian home in County Dublin. 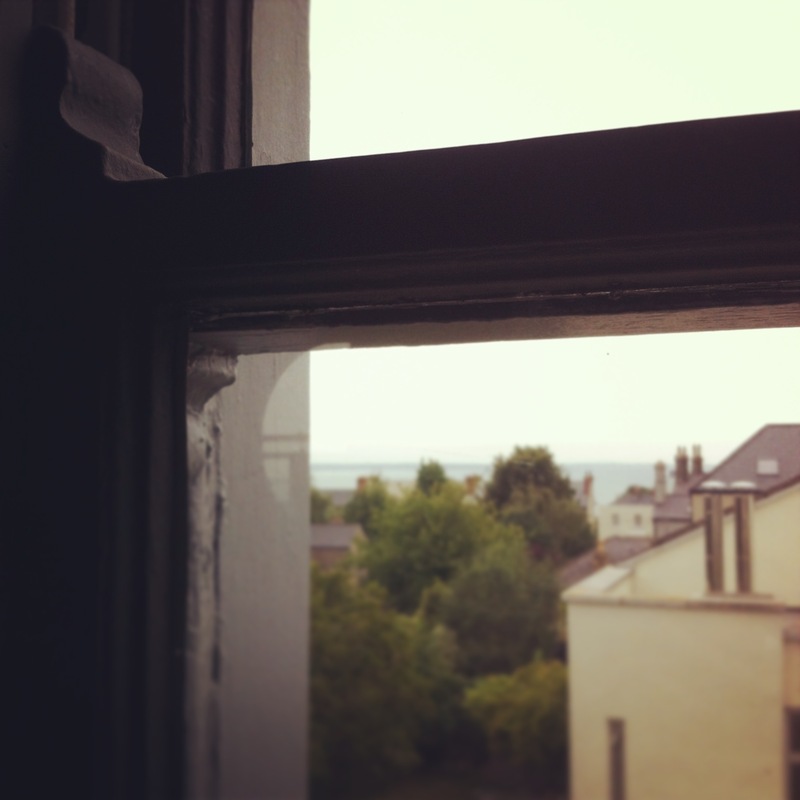 The room stretches across the width of the house and the huge sash windows look out over the neighbouring houses trickling down towards Dublin Bay. I thought the way to make the most of this would be to make the view be the star with the use of paint colours. 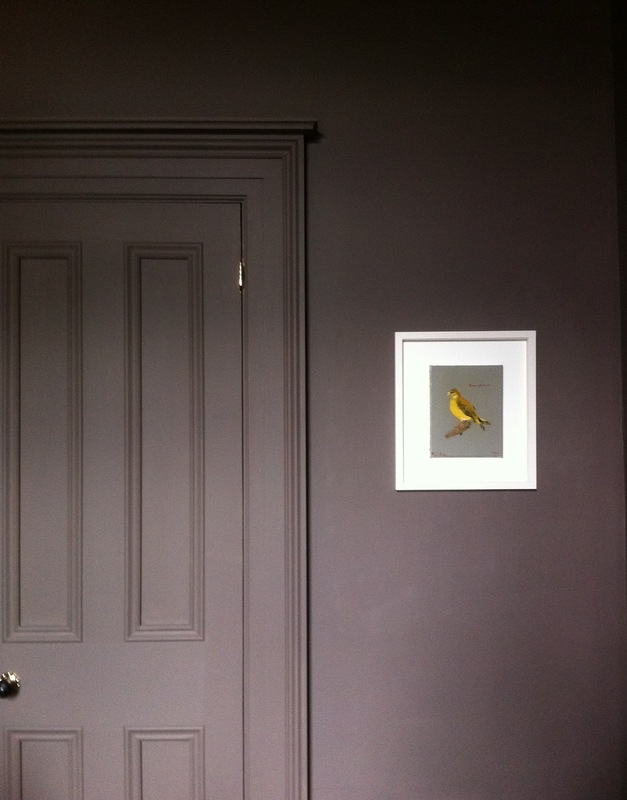 Using the gorgeous new greys from Little Greene we painted the walls in Grey Moss and all the woodwork was subtly brought out with Toad. 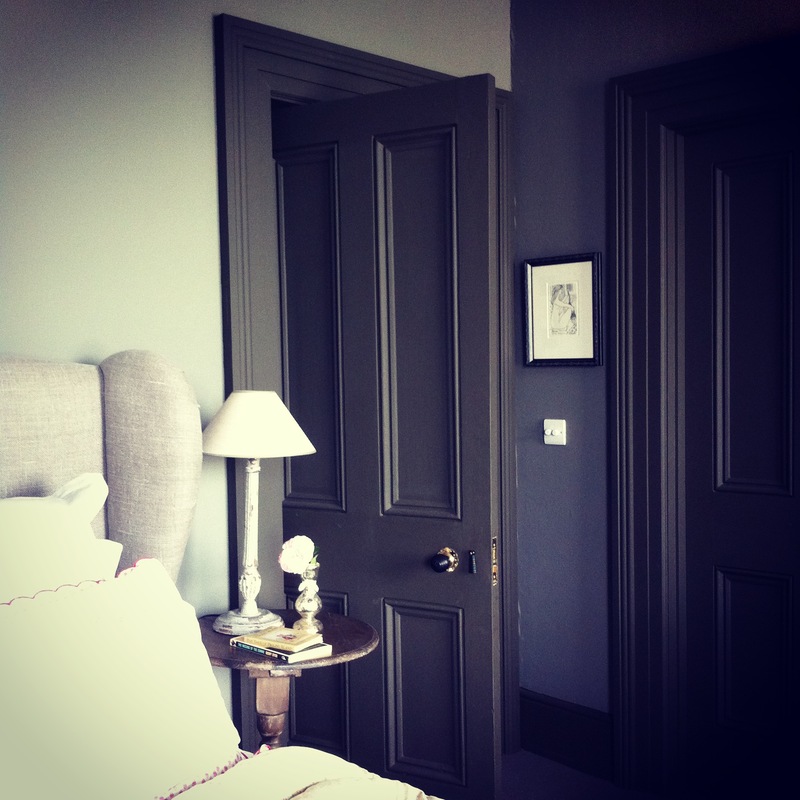 Both rich dark greys with undertones of green and brown. The ceiling was painted Down. 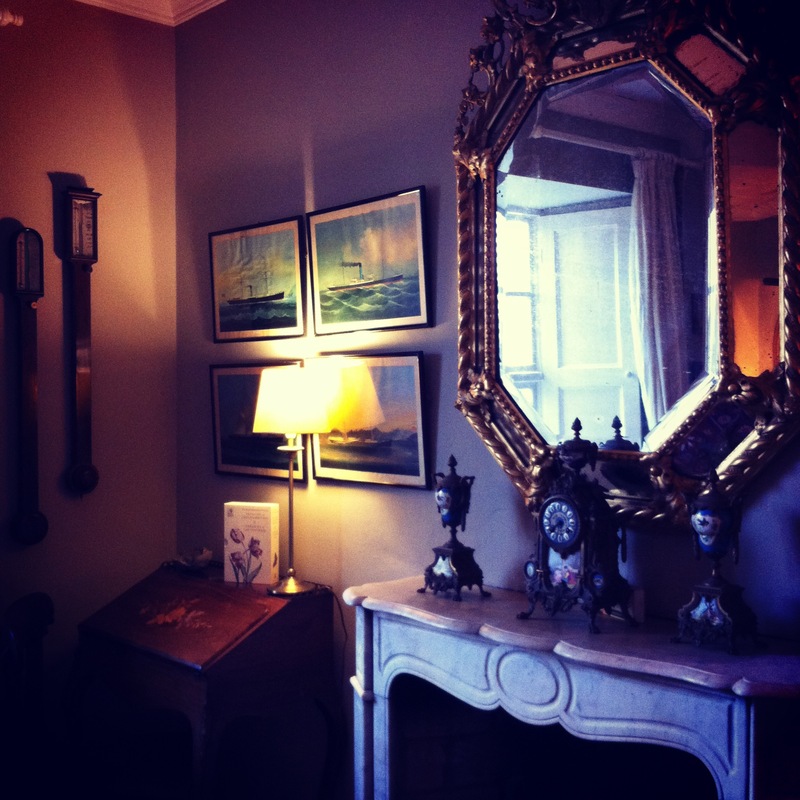 I sourced a unique mantlepiece in its raw form – its honey colour set against the warm dark walls is a picture. The result is a restful place to escape in a busy family home. Last week we embarked on an unexpected adventure. I have been on the lookout for a little dawg for a very long time. 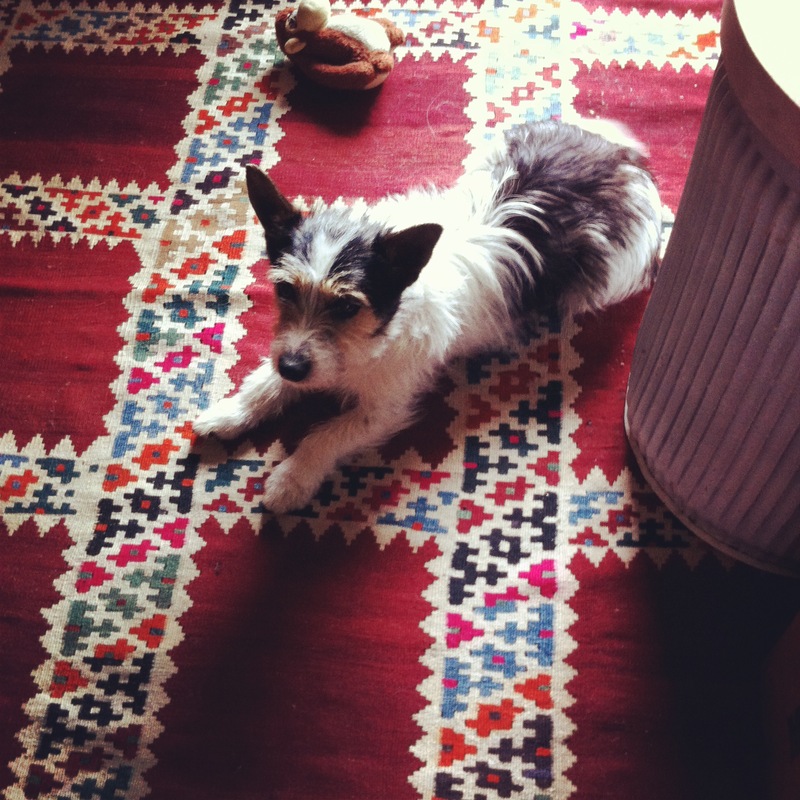 There is a fantastic dog rescue centre, Madra located on the West Coast of Ireland, and a little fella arrived there last week and when I saw him and heard about what he was like, I knew he was the one. After lengthy phone calls & to-ing & fro-ing texts and an accommodating emergency home check to make sure the house and gardens were suitable, we decided to make the trip in the hope that everything would fall into place. When I managed to book a room in one of my favourite hotels, I had a feeling karma was on our side. 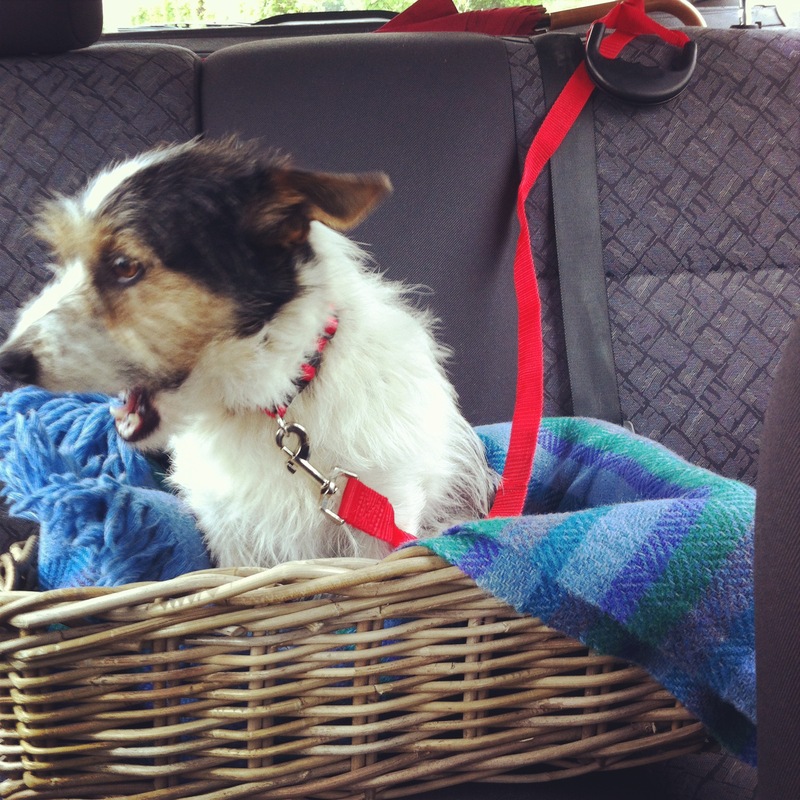 So we packed the car with lots of picnic stuff and began the long journey feeling apprehensive yet excited. After Galway City, we were done with motorways and stone walls had begun appearing for a while now and the scenery was becoming spectacular…..
Travelling on the Coast road to Án Spidéal, we were nearly there, so we found a gorgeous beach with the Aran Islands in the distance ,so parked up and had the first warm & sunny picnic of the year. My mum always used to say that food tastes nicer when eaten outside how true her words were. Back on the road and we eventually found our destination down a boreen and with my heart in my mouth I was brought to the kennels where all the dogs were wagging their tails saying with their eyes pick me! pick me!! My little fella was carried out to see me and the lead handed to me and we were encouraged to go and get to know each other so we brought him to a field and sat down on a stone wall and have a chat & a pet . He seemed very sad but offered his chin for a tickle and leaned against our knees delighted the affection. 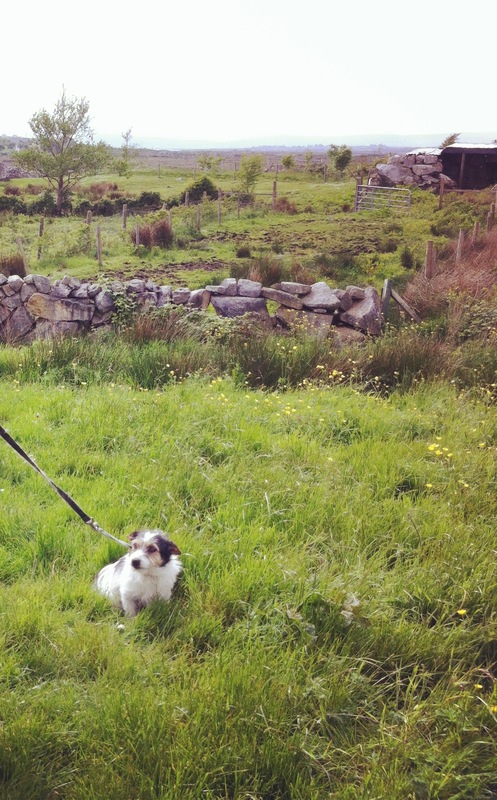 Everyone in Madra seemed a little in love with him as he is a gentle little chap just looking for love. My mind was made up and he would come home with us tomorrow. The adoption papers were signed and I tried to explain to him that I would be back tomorrow to take him. 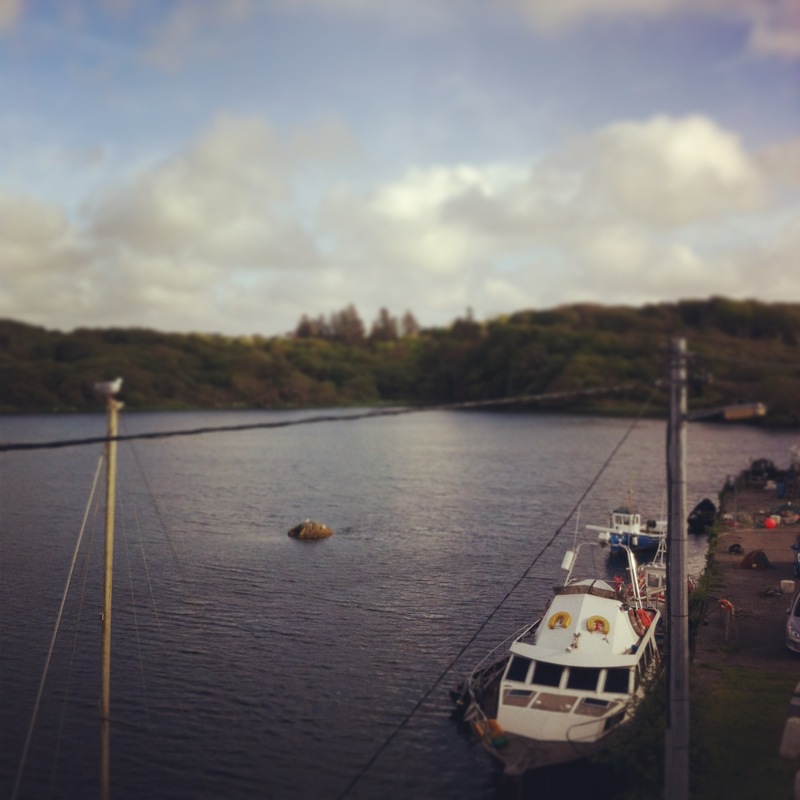 We then headed off to Clifden to take time out and be sure about the decision and to rest after the long journey. 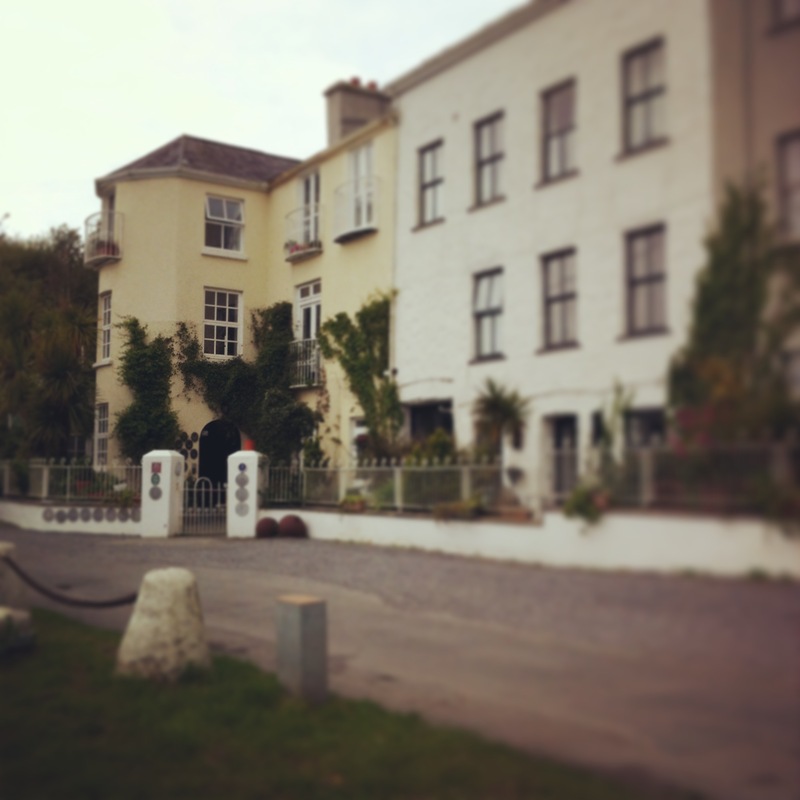 We stayed in the very special Quay House in the Harbour. 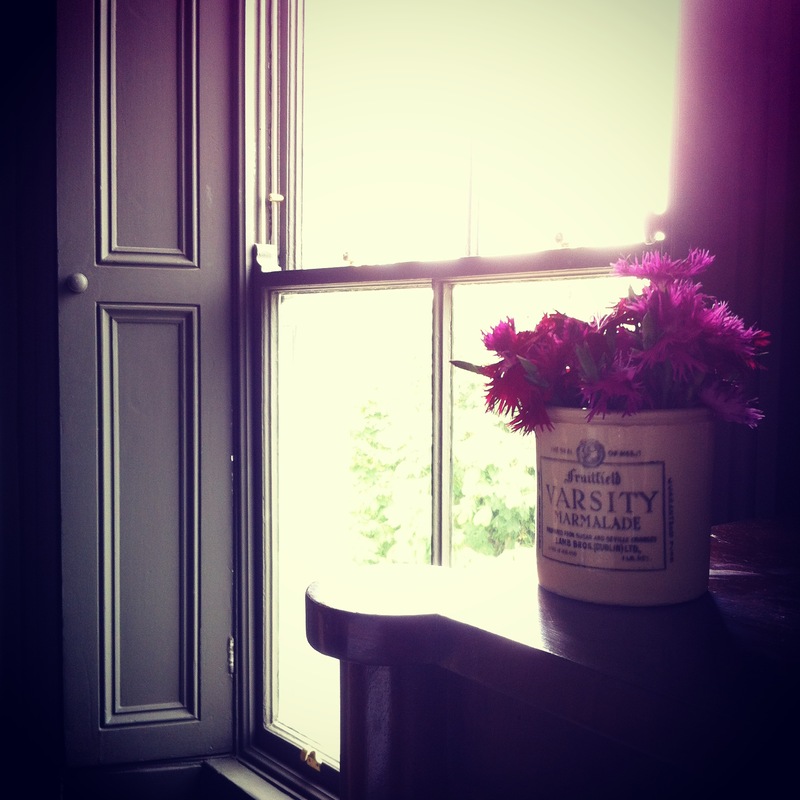 A two hundred year old building that was originally the Harbour Master’s house. 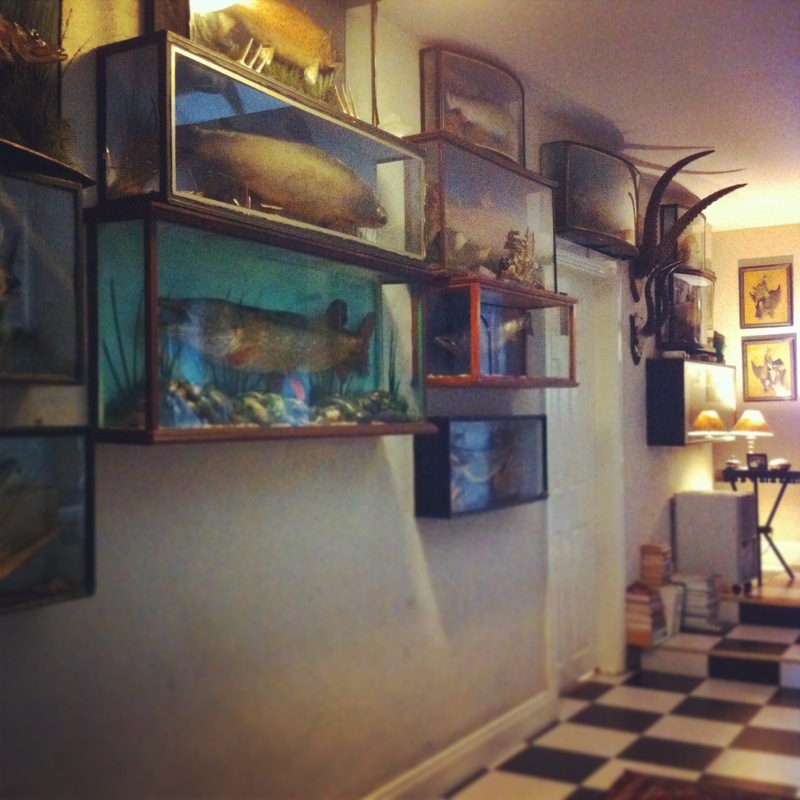 It is owned and run by Paddy & Julia (also proud owners of two very stylish pugs). They were there to welcome us when we arrived and had arranged a harbour view room for us. 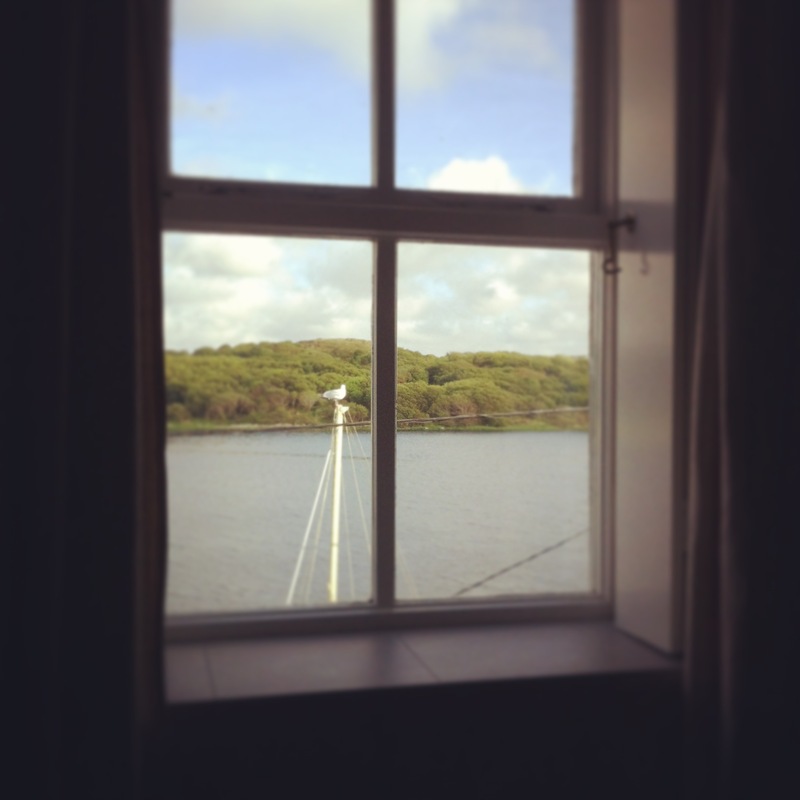 The view from the window was spectacular and really made us feel we were on our holidays – all be it a short stay! The Nautical influence is apparent also, but in the right way, no twee-ness! 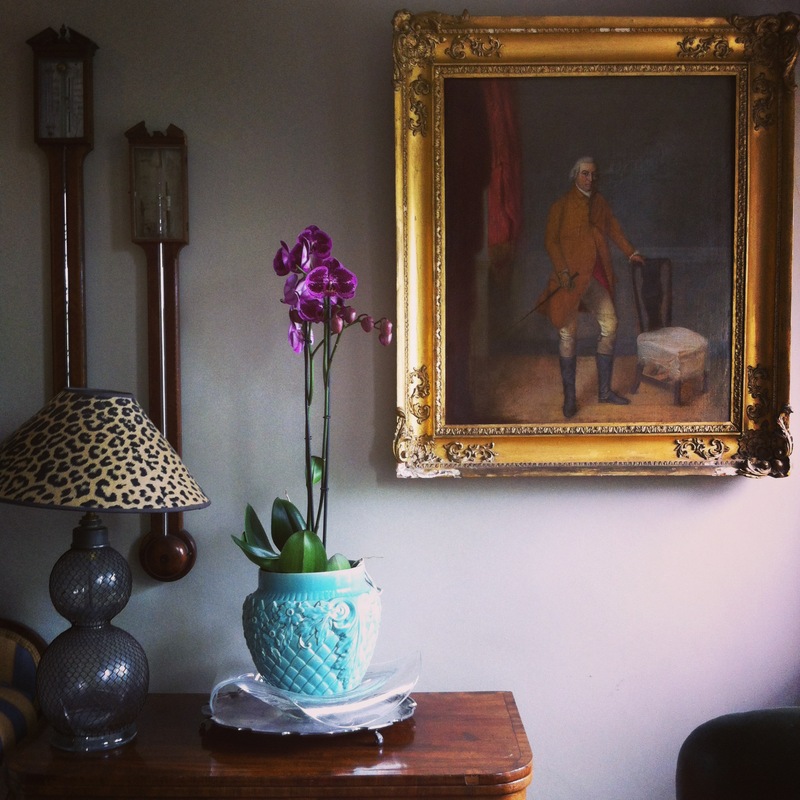 There are also classic details – like chequered floors and beautiful original old paintings in crumbly gold frames. Then there are the quirky displays dotted about. The key with these interiors, as with my own style, are that although they are stylish & ambient, they do invite you to flop in to a chair and take up a good book. 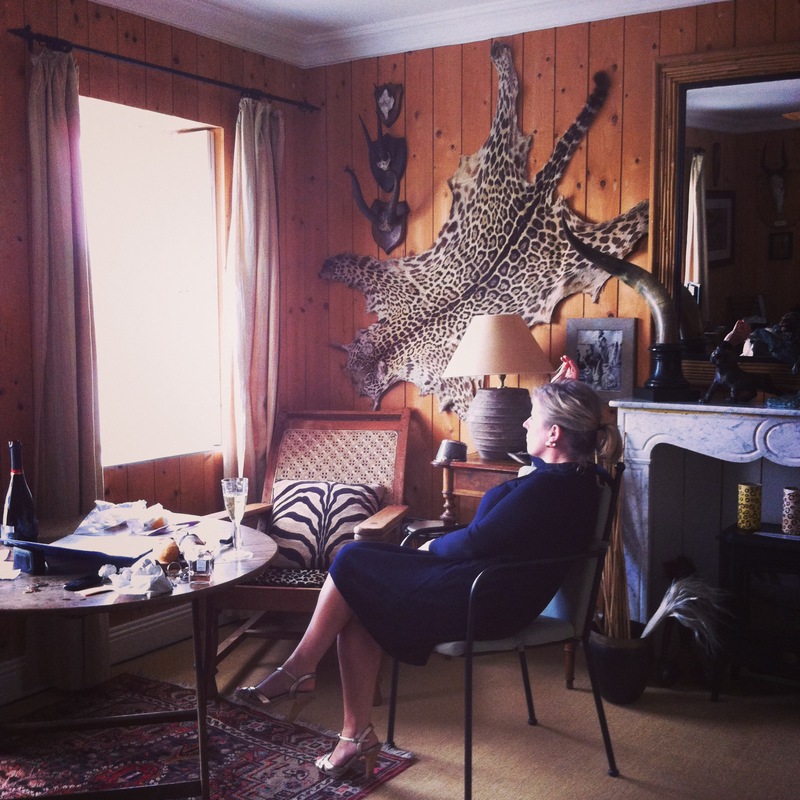 Or my favourite – standing by the mantlepiece with a glass of fizz in your hand! 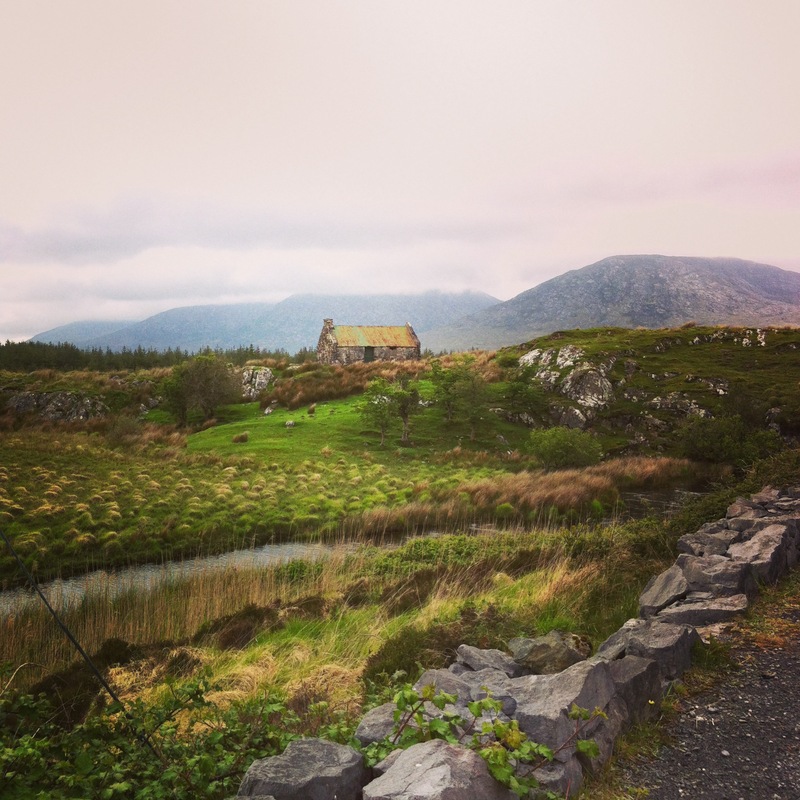 So we had a gas night out up in the town with the locals and after a walkabout the next morning we headed off back to south Connemara, this time cross country on the narrowest bog roads with all the sheep hanging about in the middle of those very roads. 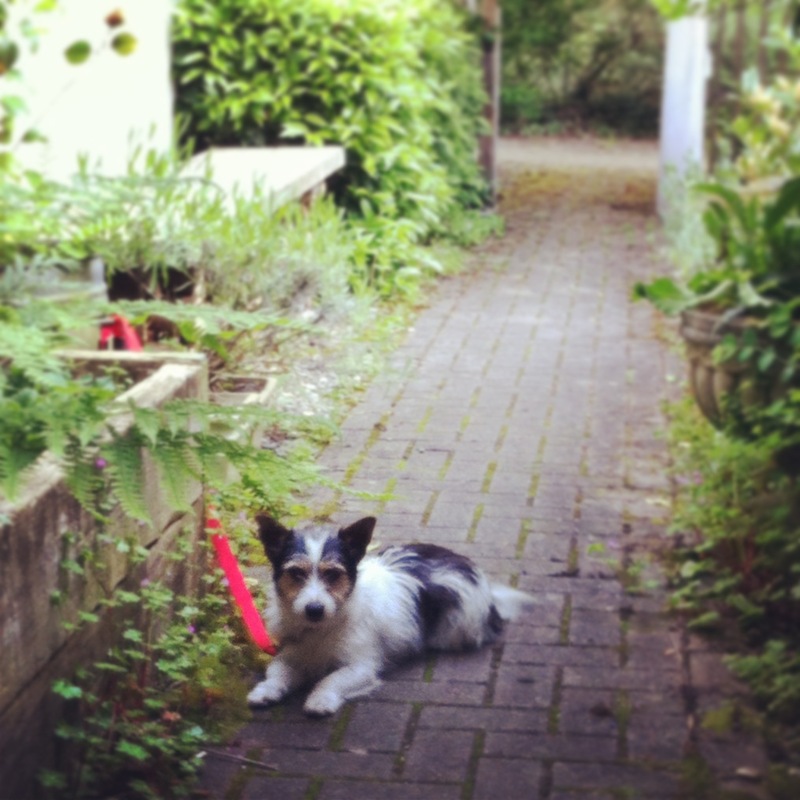 We pulled up at the dog refuge and my little fella was signed off and his jaunty new colour and lead attached. Into the car and we headed home. He was introduced to the front garden first, a bit dazed but very calm and interested. Its been intense these last few days, and when he is trying to be independent, every few moments he has to come back to check and see if I am still there. But I think he is beginning to realise he has come home. As I sit at my desk and type, he is asleep at my feet snoring away, content. Mission accomplished. 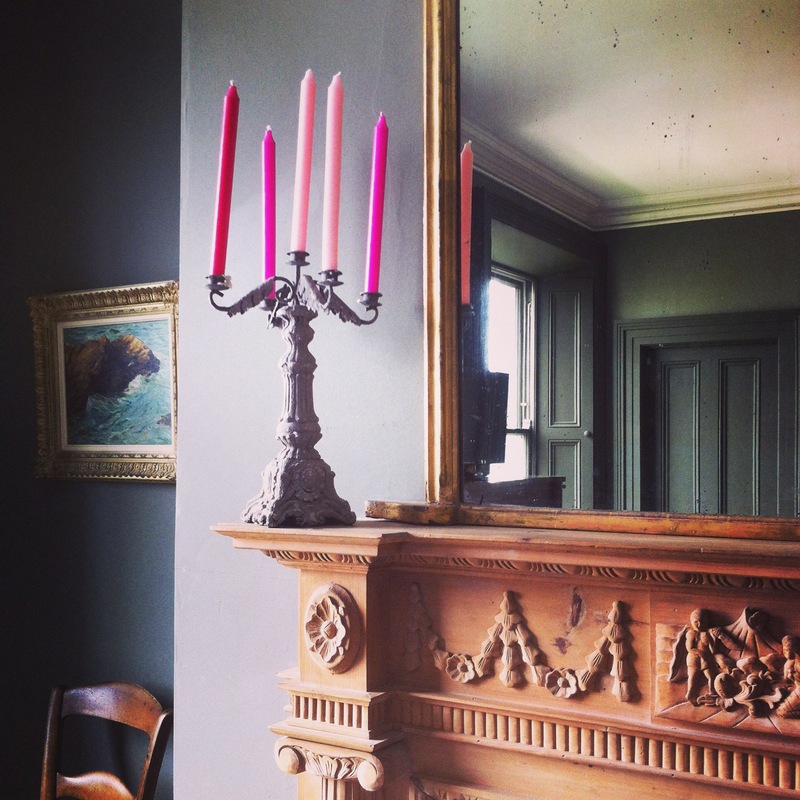 I am sitting in the sunshine writing this, casting my mind back to the Winter months when I began consulting on an early Victorian house restoration in Dublin. The new owners had a fab sense of style but really wanted to do justice to this, their forever home. 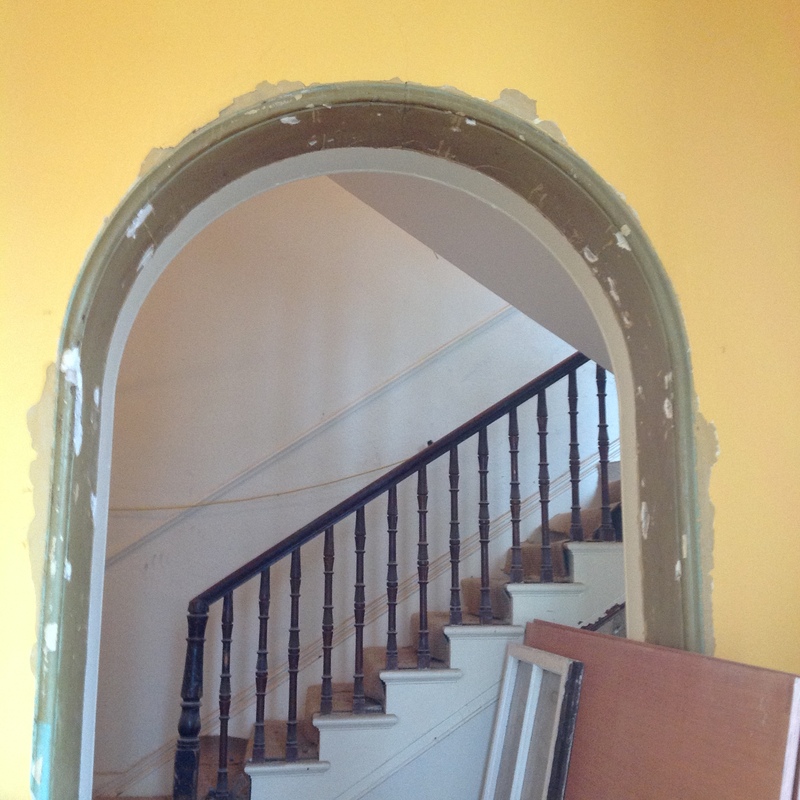 It had been broken in to flats in its previous existence and now needed to be brought back to life in a new chapter of becoming a home for a young family. I remember we were numb with the cold, walking around trying to imagine how it was all going to look as all the windows had been taken out. 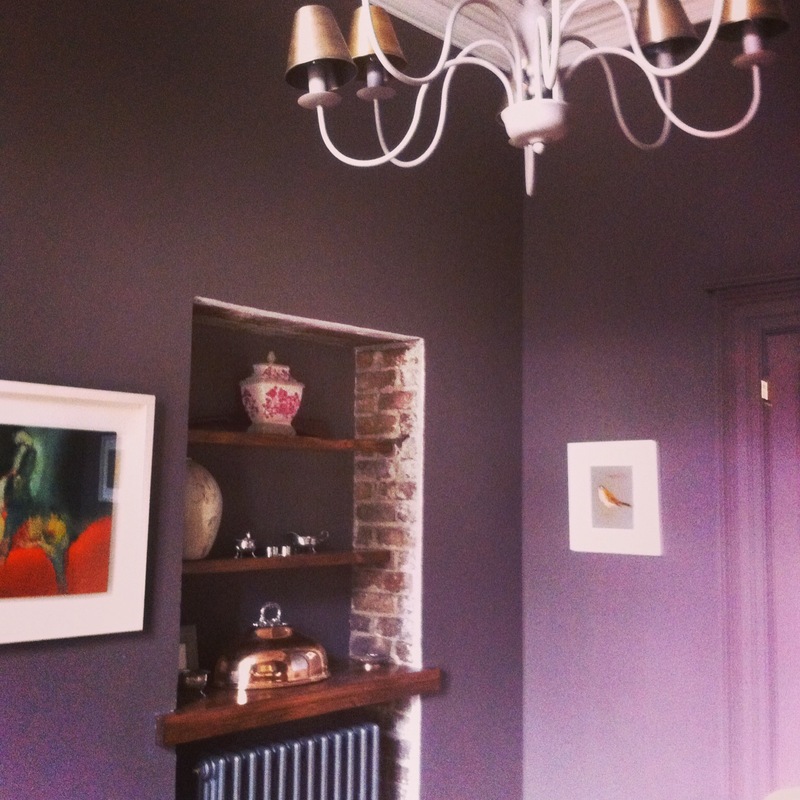 The owners were great, they wanted to push the boundaries with their choices of colour and be brave. 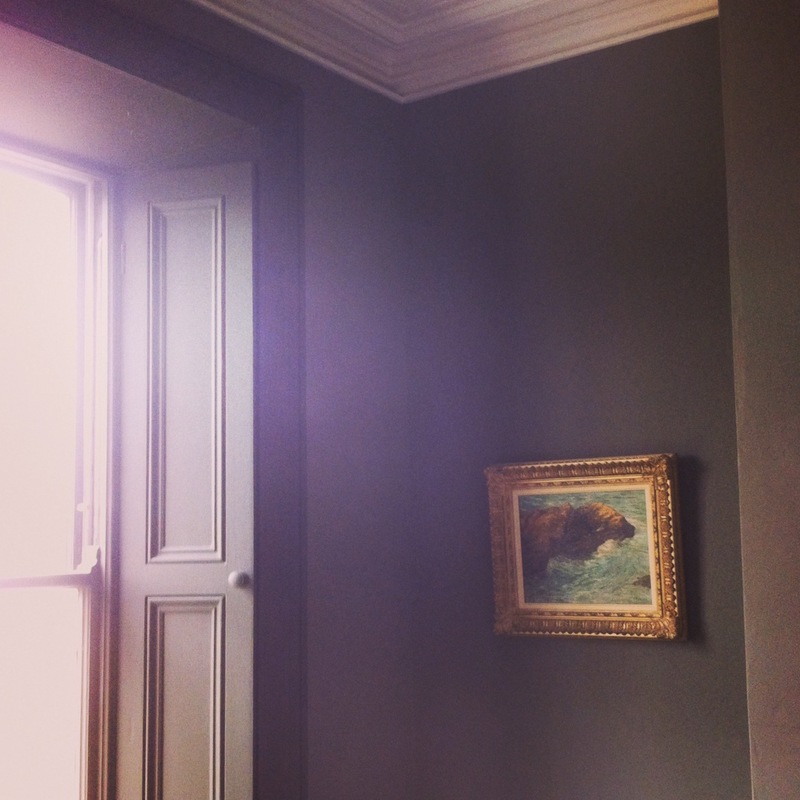 They understood that how they painted their walls was going to dictate the atmosphere of each room. This was their chance to put their own mark on the house. 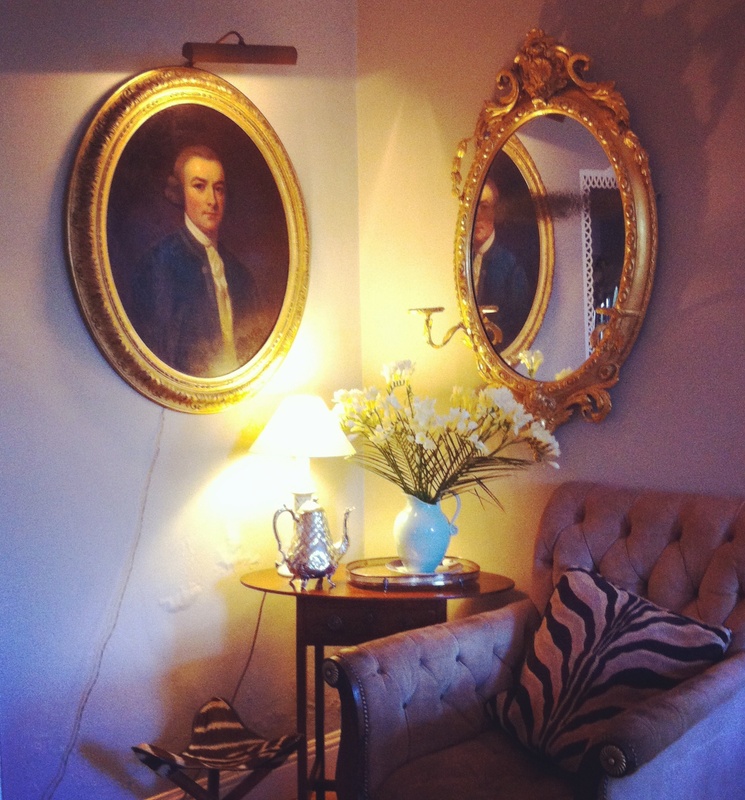 Spring has come and the house is now a home…. 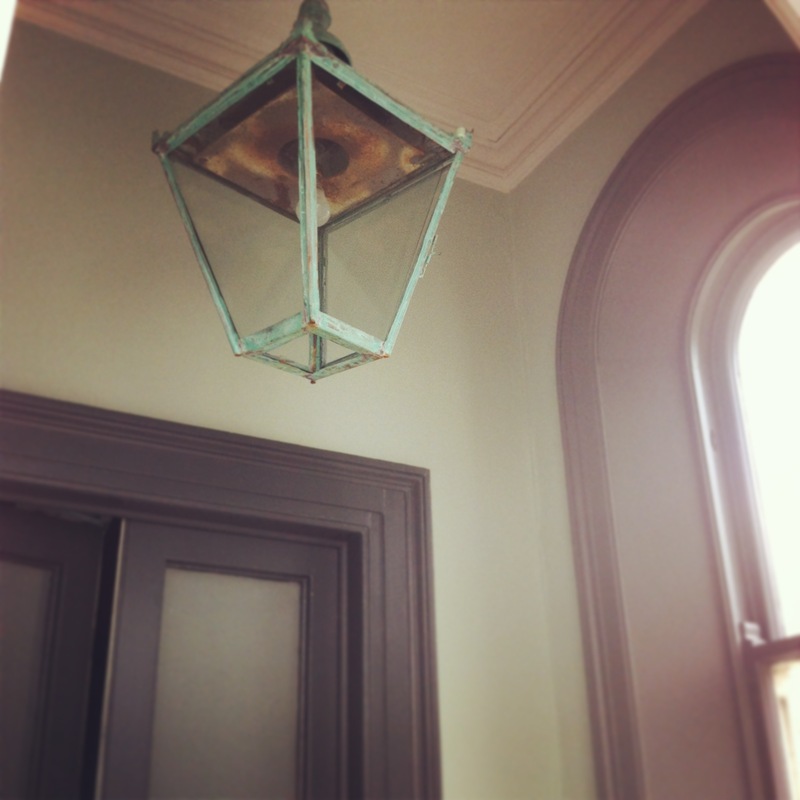 The outer entrance hall is a fresh pale green echoing the vert de gris in the reclaimed coach lantern. 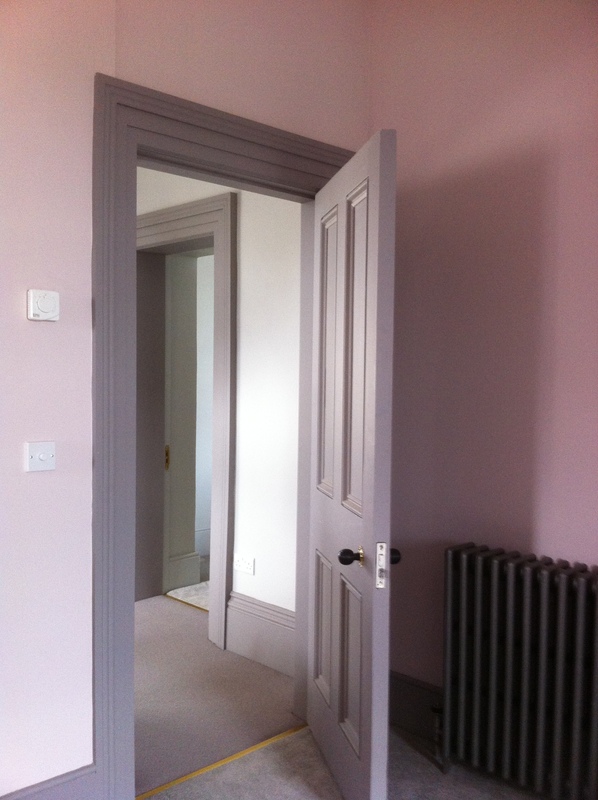 The entrance hall is a deep and dramatic colour. …. 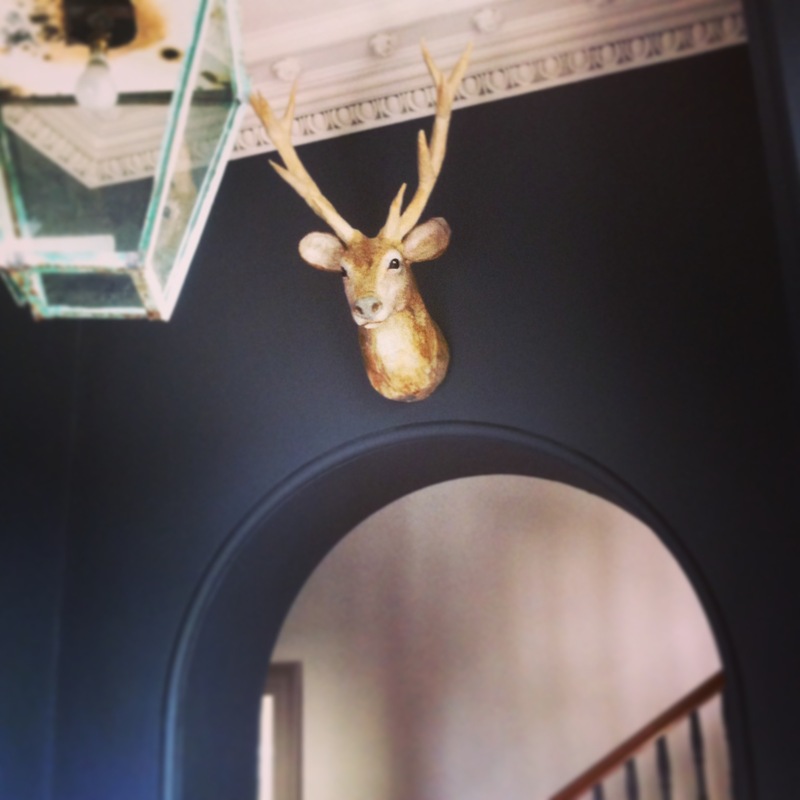 with the owner’s quirky papier maché deer head to greet visitors with his tongue firmly in his cheek. 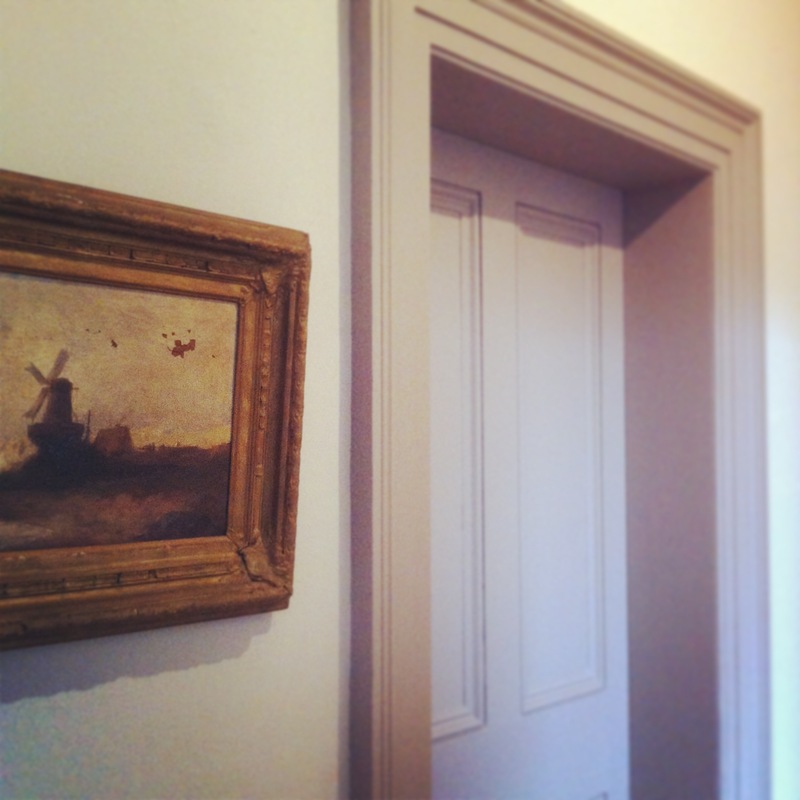 This leads to a lighter hall, stairs and landing with all the architraves becoming features by being painted in a darker hue to the walls. 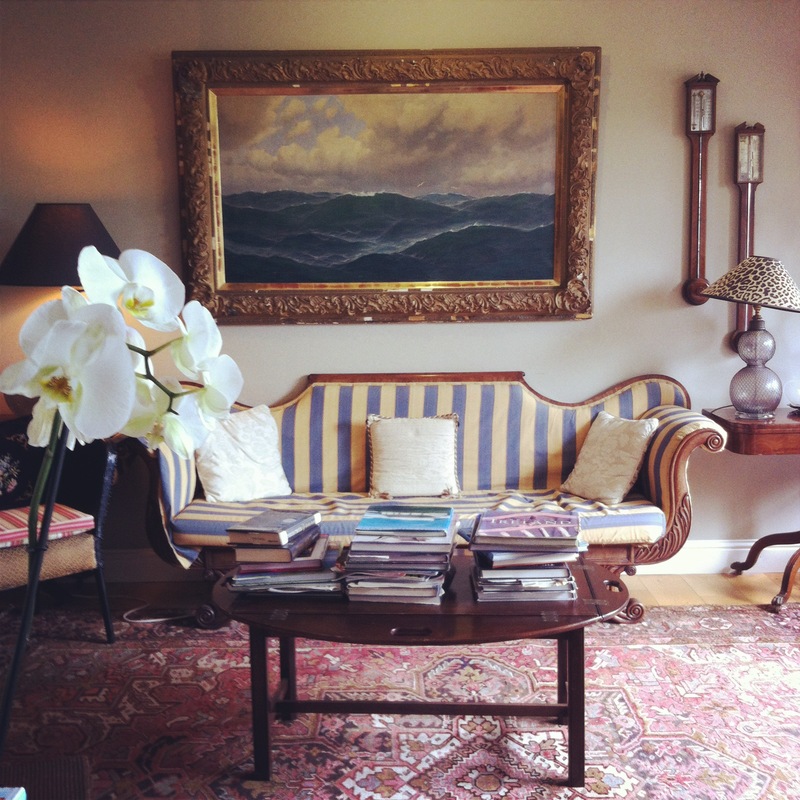 The owners fell in love with this painting a few years ago after seeing it in a bidding raffle. I think they were destined to have it. The newly built boot room fulfills its function but is also a nice place to sit. 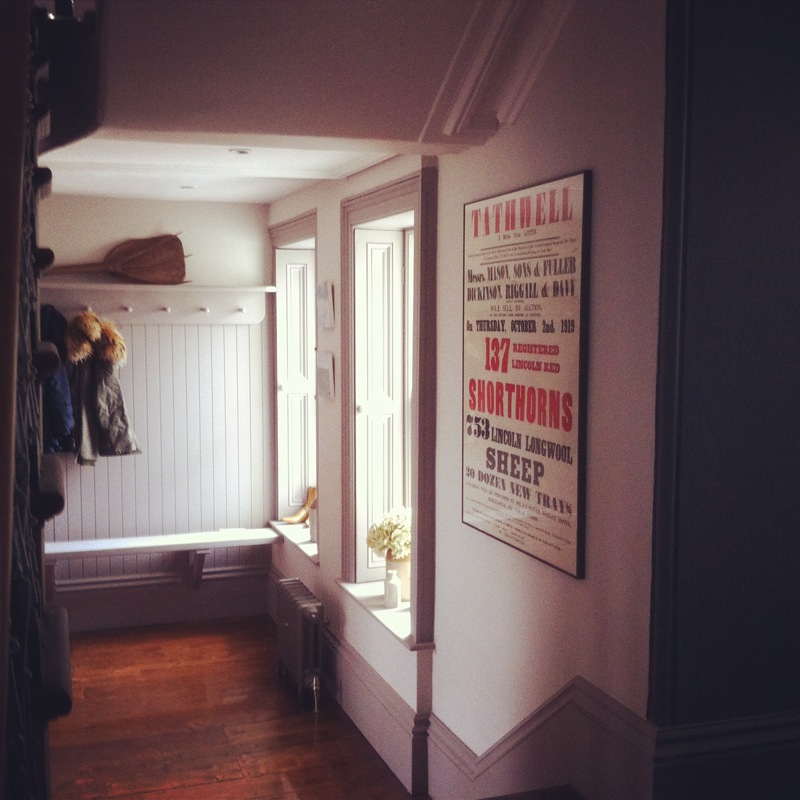 The graphic poster advertising a sheep auction dating back to 1919 is a favourite of the owners and sits well in the ‘downstairs’ space. 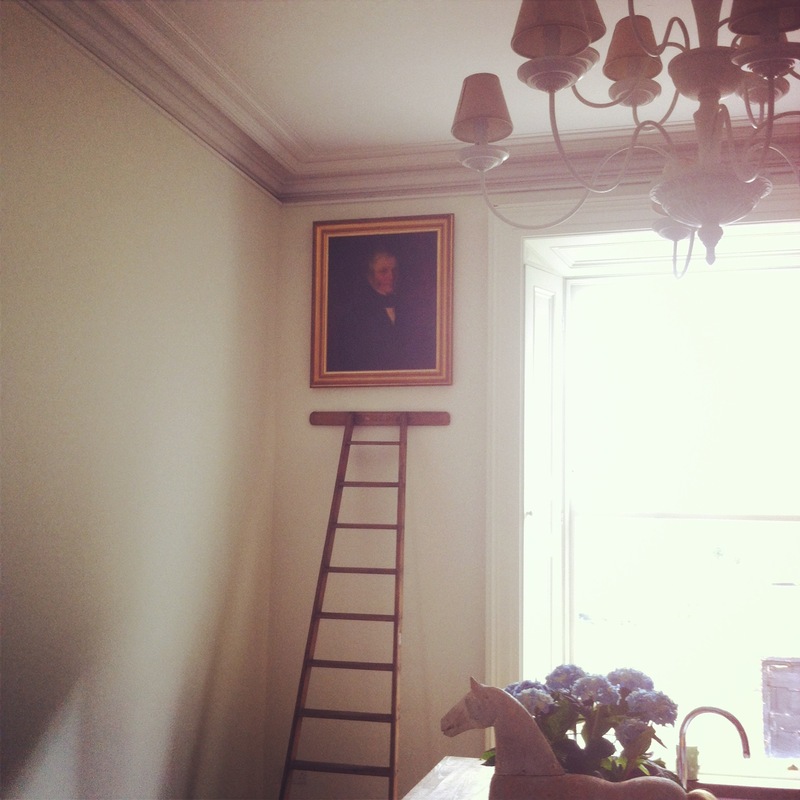 In fact all the artwork already owned by the family has found a place that seems right for it – throughout the house, the family’s personality shines through. The dining room, which is mostly used in the evenings, is richly atmospheric with the artful details popping out of the rich clay colour of the walls. The chandelier has unexpected copper shades. 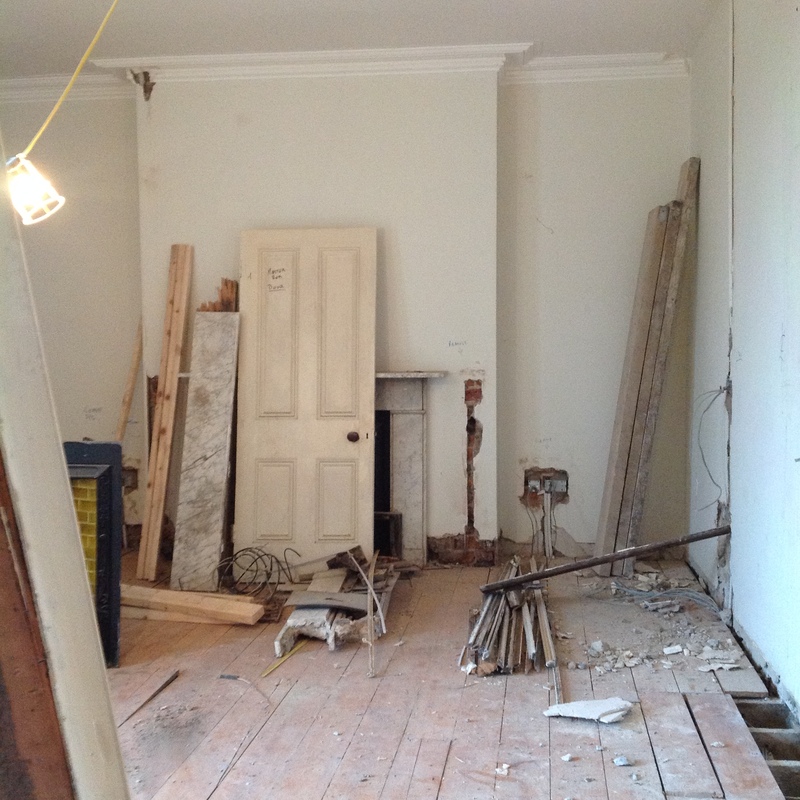 When viewing the house at its skeletal phase, the doorway from the hall was being closed off, I suggested creating a butlers alcove in the dining room keeping the bricks of the doorway exposed and using reclaimed planks as shelves, the terracotta adding warmth to the room, but also the feature is reminder of how far the house has come. 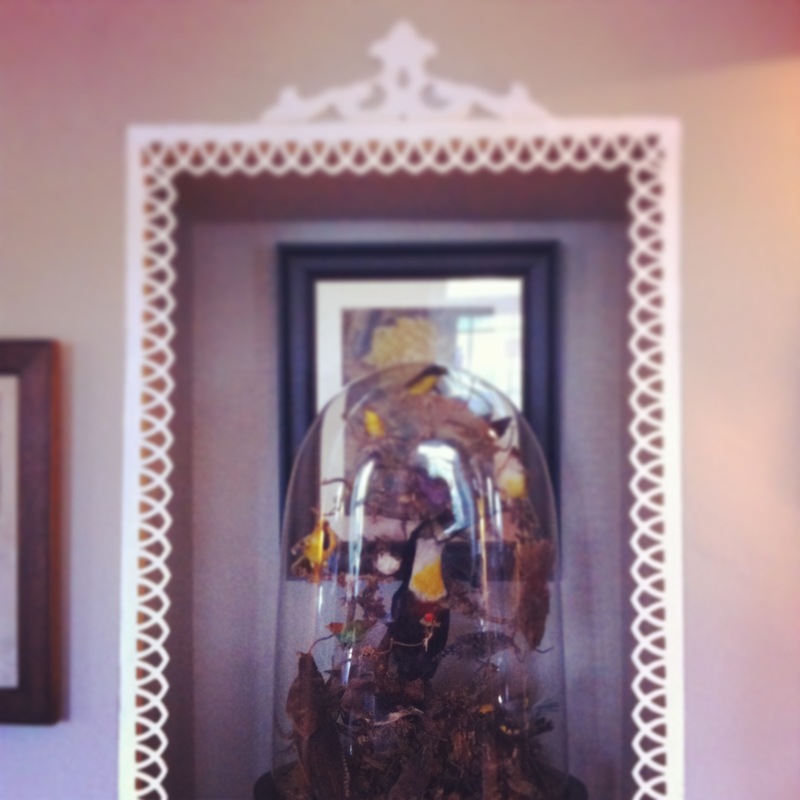 This now houses a gorgeous copper & silver cloche bought by the owner for a song! 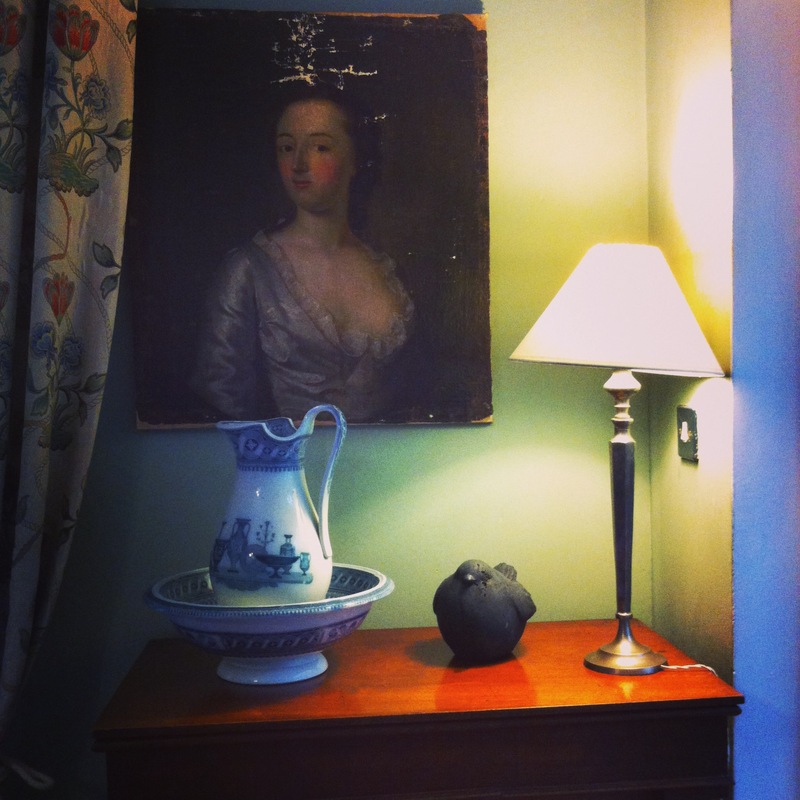 Upstairs in one of the bedrooms, a beautiful little oil is the star. 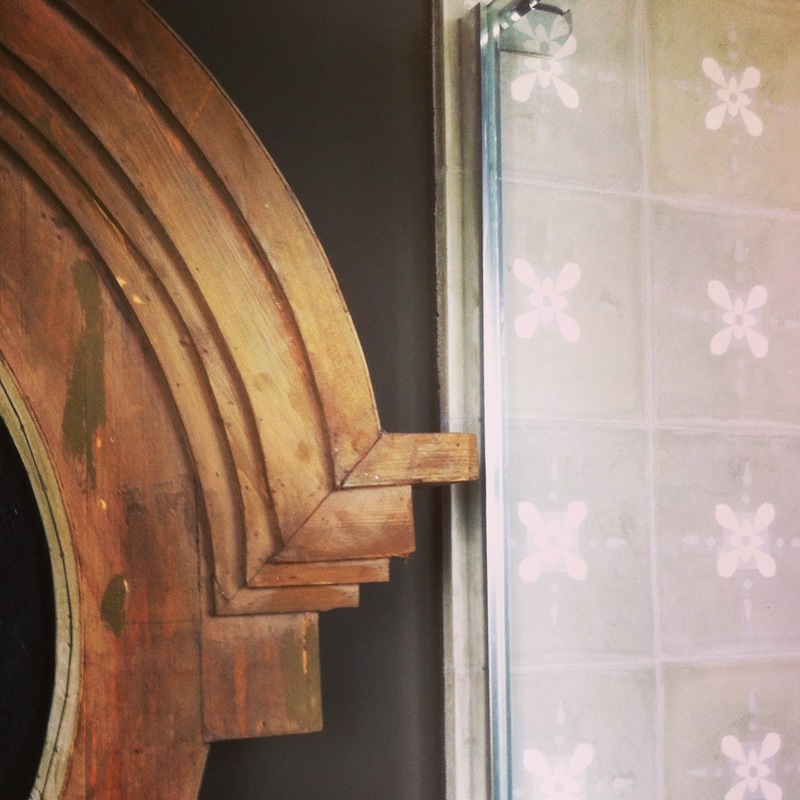 The new greys from Lilttle Greene work fabulously with the textures of the wooden mirror and the concrete tiles. 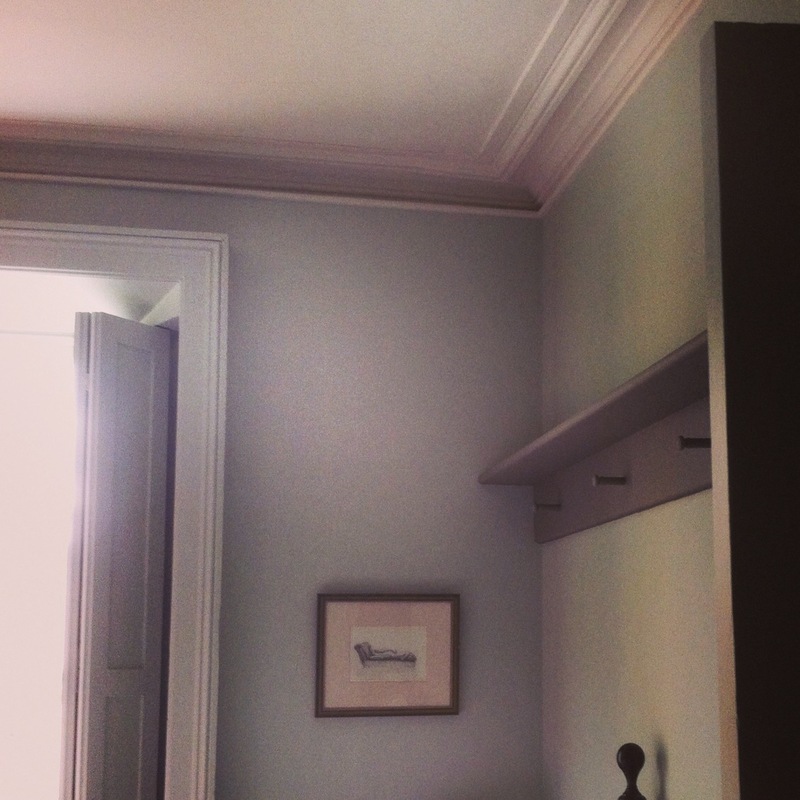 The guest room is pale and fresh – a haven for visitors to feel spoiled with a very thoughtful peg rail for their overnight things. 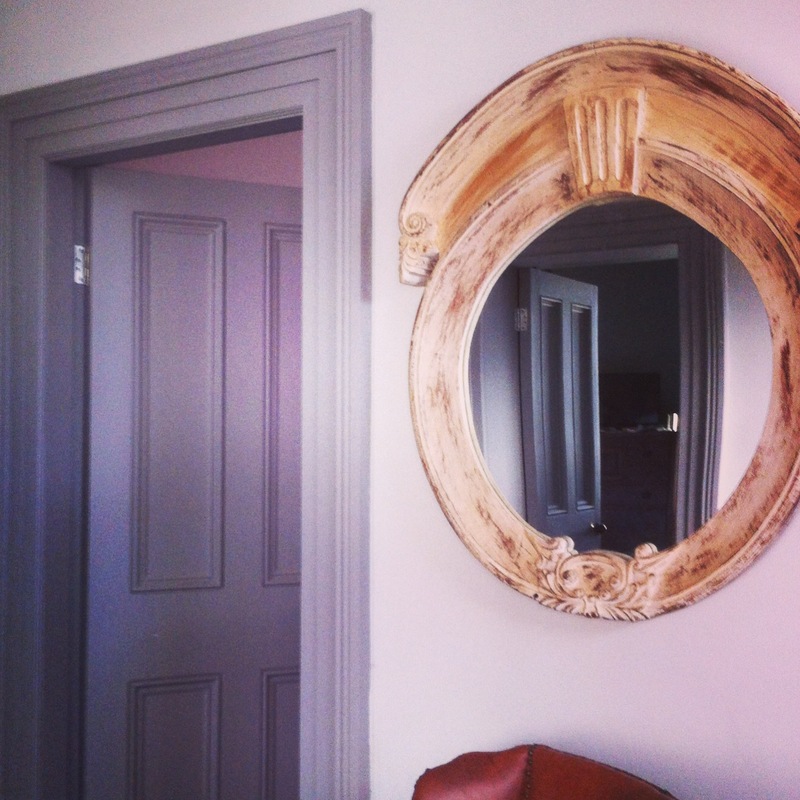 The round mirror came from the previous home and fits in with the style of the new. 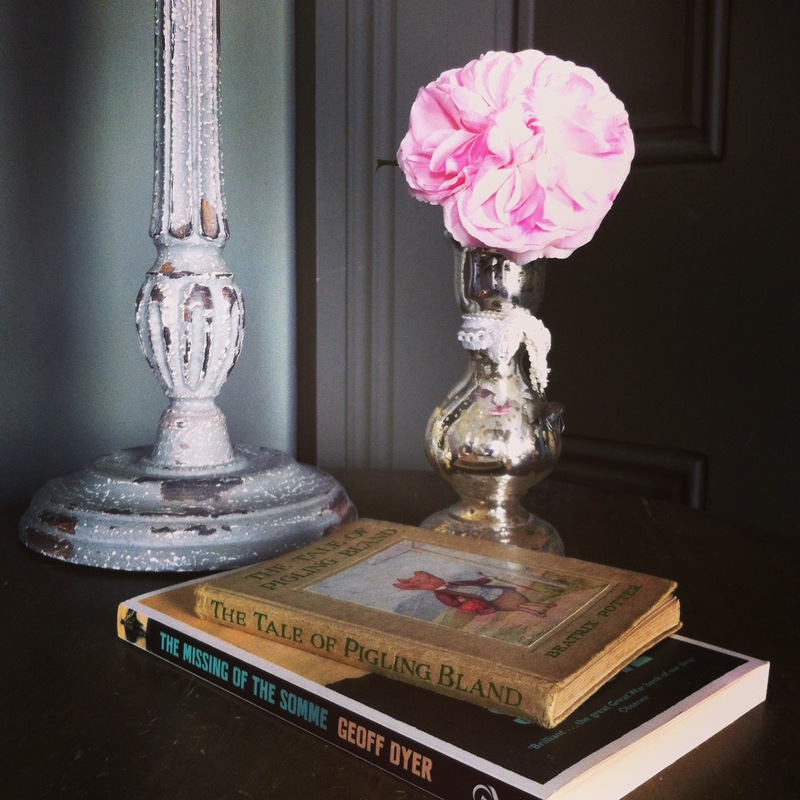 A pale pink echoes plaster in the children’s room. When it came to moving in stage, I came back for the fun bit – to curate where the decorative pieces and artworks would go, the final piece of the jigsaw. 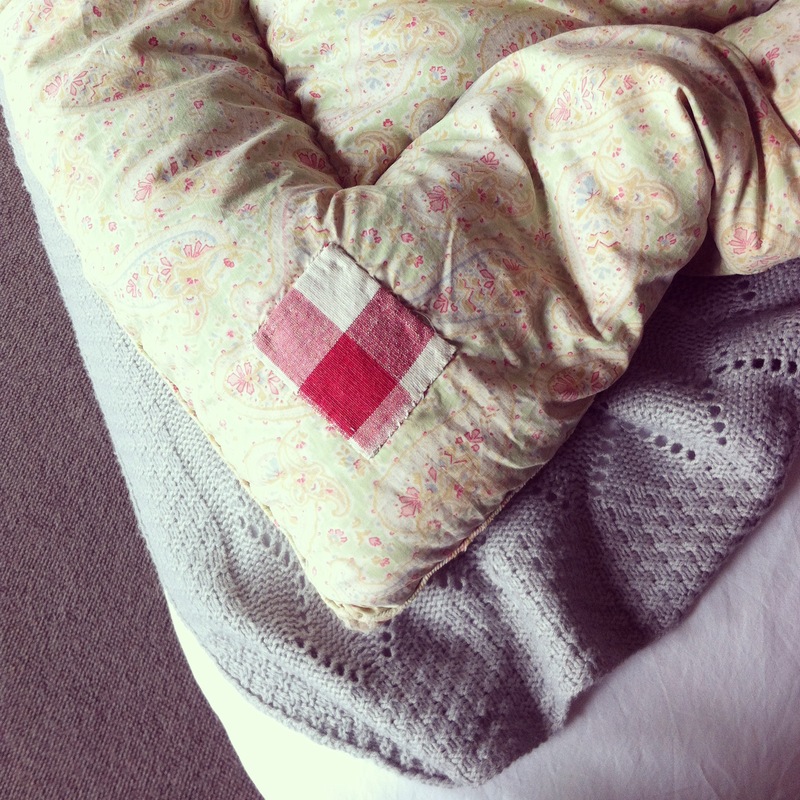 It is these details that set off the carefully considered hues. 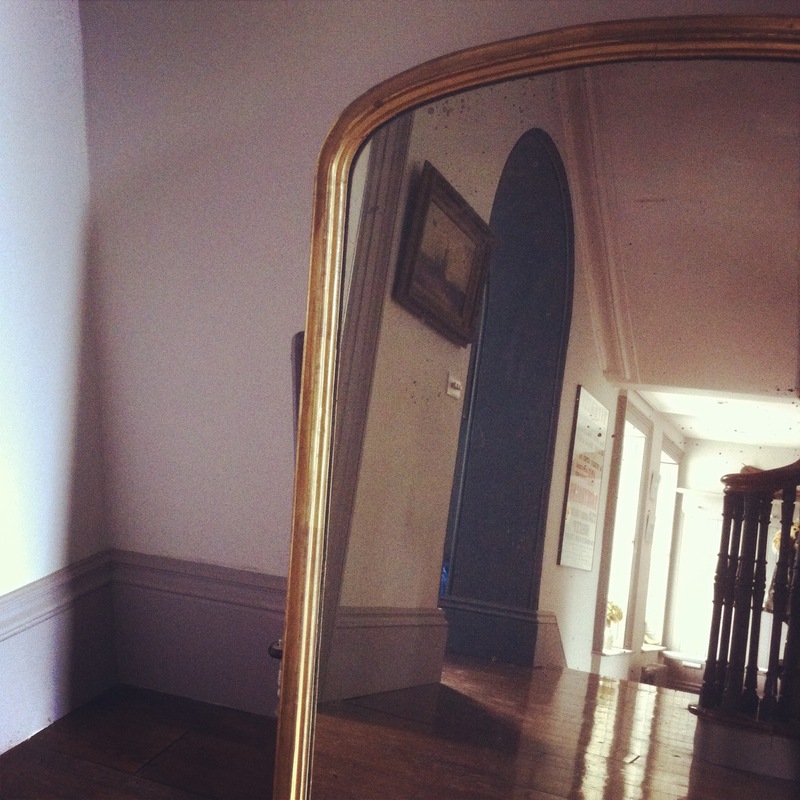 The house feels fresh and very now, while it has an awareness of it’s past. It is grand yet homely and quirky, therefore very much a home to relax and entertain while a young family have room to grow and enjoy it with friends. 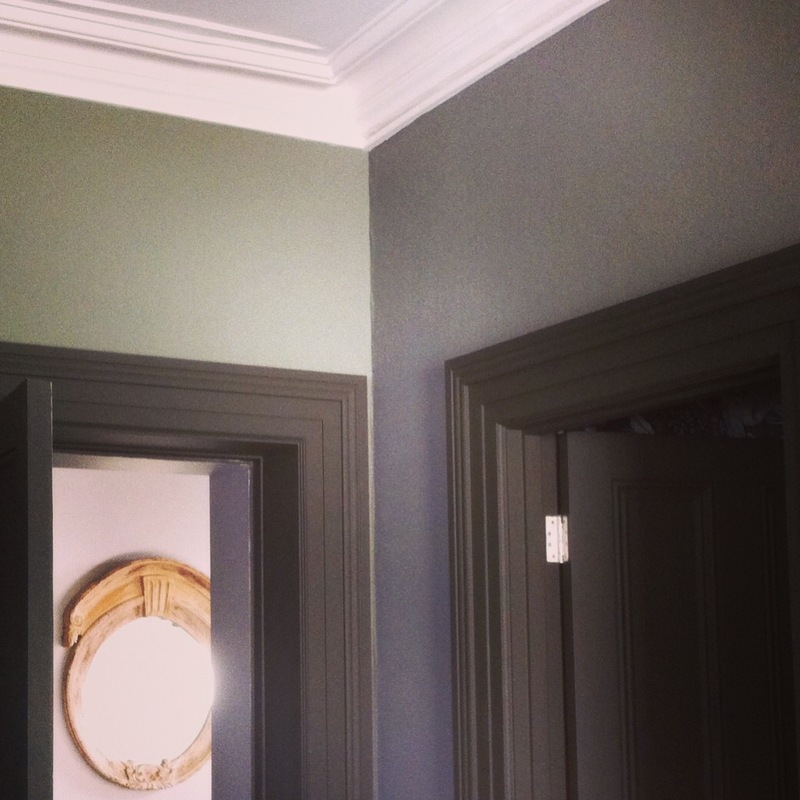 A colour consultation is very worthwhile in making sure you really make the most of a space and the atmosphere there is the possibility to create. 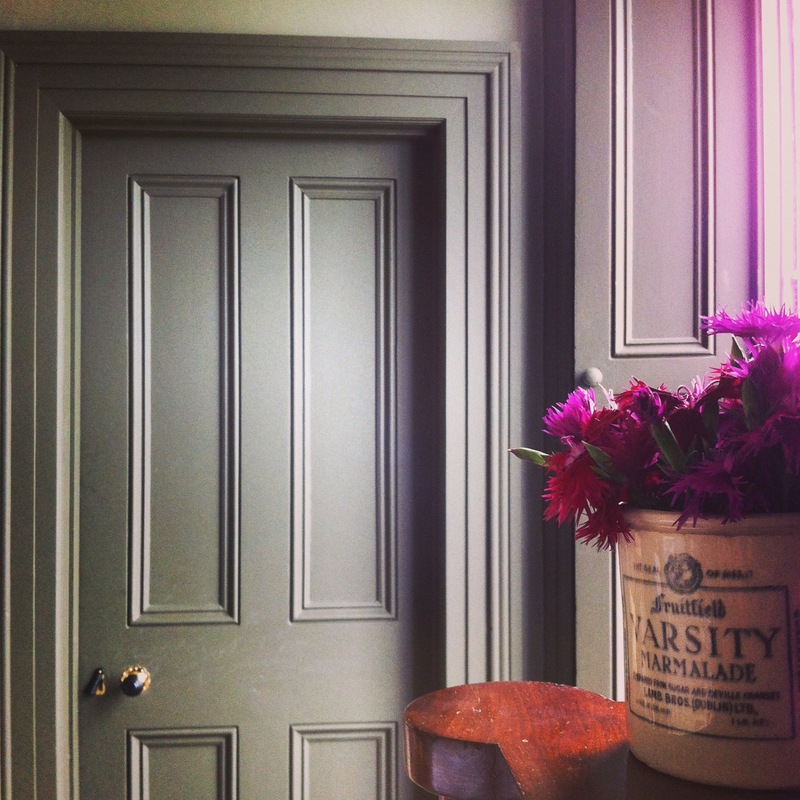 Have just painted a test patch of Setting Plaster by Farrow & Ball, it is beautiful as a backdrop for natural finds don’t you think?